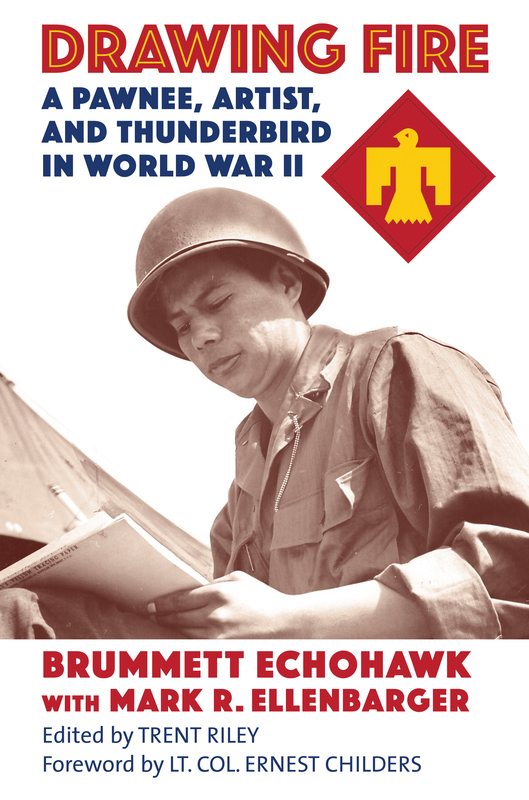 In 1940 Brummett Echohawk, an eighteen-year-old Pawnee boy, joined the Oklahoma National Guard. Within three years his unit, a tough collection of depression era cowboys, farmers, and more than a thousand Native Americans, would land in Europe—there to distinguish themselves as, in the words of General George Patton, “one of the best, if not the best division, in the history of American arms.” During his service with the 45th Infantry, the vaunted Thunderbirds, Echohawk tapped the talent he had honed at Pawnee boarding school to document the conflict in dozens of annotated sketches. These combat sketches form the basis of Echohawk’s memoir of service with the Thunderbirds in World War II. In scene after scene he re-creates acts of bravery and moments of terror as he and his fellow soldiers fight their way through key battles at Sicily, Salerno, and Anzio. Woven with Pawnee legend and language and quickened with wry Native wit, Drawing Fire conveys in a singular way what it was like to go to war alongside a band of Indian brothers. It stands as a tribute to those Echohawk fought with and those he lost, a sharply observed and deeply felt picture of men at arms—capturing for all time the enduring spirit and steadfast strength of the Native American warrior. Brummett Echohawk was born in 1922 in Pawnee, Oklahoma, into a family with a military tradition dating back to the Indian Wars of the 1860s, when his grandfather Howard Echohawk served as a famed Pawnee scout. A celebrated illustrator and artist best known for his focus on the American Indian and the American West, he also designed the flag of the Pawnee Nation and worked on several projects, including, with Thomas Hart Benton, the mural Independence and the Opening of the West at the Truman Memorial Library in Independence, Missouri. For his service in the World War II, Echohawk earned a Combat Infantry Badge, a Bronze Star Medal, the US Army Commendation Medal, two Invasion Arrowheads, a Purple Heart with two Oak Leaf Clusters, and a posthumous Congressional Gold Medal. Mark R Ellenbarger is retired from the aviation/aerospace industry where he worked in developmental-prototype engineering. He is the founder of the Brummett Echohawk Project. Through the project, Mark works to honor the memory of our WWII veterans through a unique program where Echohawk’s legacy is continued. Through this amazing project families of WWII veterans from all parts of the world have been reconnected. Mark is the great-great grandson of Lucy Wagon Sarcoxie-Patiacow, the oldest Delaware Indian on record at 107 years of age by the tribe. Mark is of Delaware/Cherokee descent. Trent Riley is a Public Historian currently serving on the staff of the National Cowboy and Western Heritage Museum. Lt. Col. Ernest Childers (US Army retired) is a World War II veteran, Medal of Honor recipient, and Muscogee (Creek) Indian.